Shuffler.fm finally released its free, official iPad (s aapl) app for public consumption in the App Store on Tuesday, after talking about its plans for an Apple tablet version first in August. The music discovery tool pulls its content from music blogs, combining them in a Flipboard-style experience specifically aimed at helping you build your listening library. Unlike other social music discovery tools, Shuffler.fm isn’t basing its findings on your existing tastes, as Last.fm (s CBS) or Pandora (s P) do. 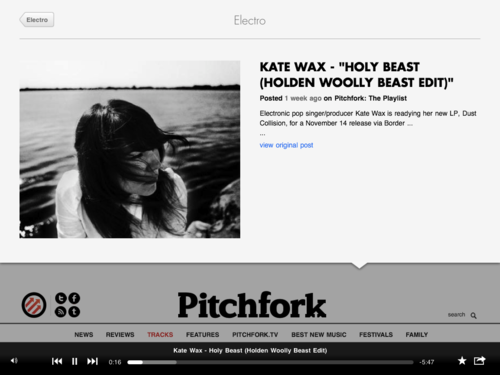 Instead, it aggregates and organizes content from popular online music blogs, like Pitchfork, TheMusic.FM, Stereogum and many more. Content is then organized by genre-based channels, which also help populate a playlist of tracks you can play back from the bottom of the iPad interface while you read about the very songs you’re listening to. 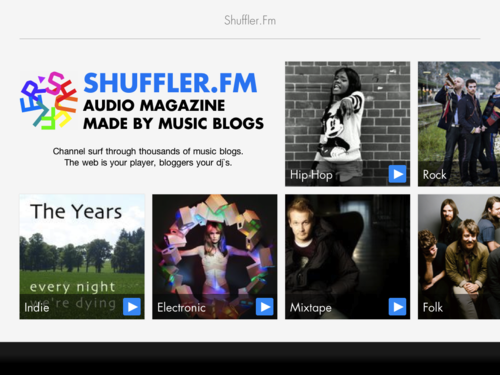 The idea behind Shuffler.fm is great, since it provides an alternative to algorithm-based recommendations in services like Pandora that often provide quite a narrow view of a user’s listening habits. By using curated blog-posted content, Shuffler.fm allows users to be much more broad in their approach to music discovery while also providing the advantages of some kind of editorial filter to prevent information overload. 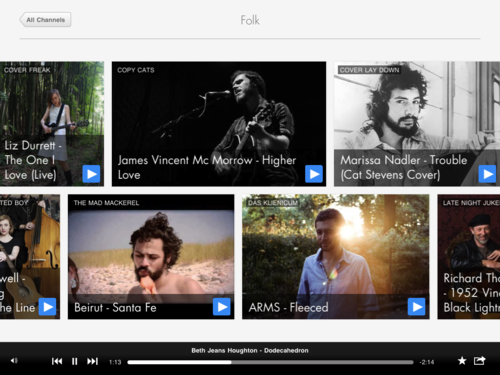 Shuffler.fm’s iPad app design is simple, even more so than its web-based version. But through its simplicity it does a good job of getting out of the way of the music while at the same time presenting it in a visually attractive way. The presence of the blog-fueled radio playback interface, with its bookmarking (with a free Shuffler.fm account) and sharing options (email, Facebook and Twitter), also helps ensure that you agree with what you are reading about tracks and that you can share them with friends if you come across something you think they should hear. That sharing element could become even more integrated in the future, as Shuffler.fm co-founder Tim Heineke told me that there are plans in the works “to connect [Shuffler.fm] more to your current social network of sharing,” but that there’s nothing definitive he can share at this point. The only thing I’m not crazy about in Shuffler.fm is that to read full articles about the tracks in question, the app uses an in-app browser to direct you to the website of origin. I’ve been spoiled by nicely formatted reading views from apps like Flipboard (for some articles, though not all) and Instapaper. But at least Shuffler.fm is directing some traffic back to the websites that supply its content, which in the end is better than my selfish desire to read things in a slightly more easy-to-digest format.